Embattled Virginia Lt. Gov. 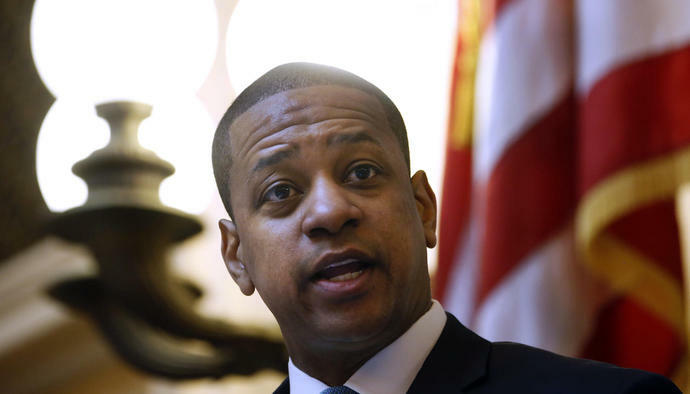 Justin Fairfax has lost several staff members after two women accused him of sexual assault and much of the state's political establishment called for him to resign. Two of his three state staffers resigned as well the director and the fundraiser of his political action committee. Their departures were first reported by the Richmond Times-Dispatch. Fairfax spokesman Lauren Burke said in a statement that the Democratic lieutenant governor "wishes them well." The duties of Virginia's lieutenant governor are largely ceremonial and part time, but the office is often a springboard for a gubernatorial run. Two women came forward last week with allegations that Fairfax sexually assaulted them, prompting widespread calls for his resignation. Fairfax has denied the allegations and said he won't step down. A Virginia lawmaker says he's been called a racist on social media for threatening to begin impeachment proceedings against Lt. Gov. Justin Fairfax over sexual assault allegations made by two women. State Del. Patrick Hope, who is white, tells The Associated Press that he called for an impeachment proceeding to begin because he believes it would trigger an investigation into the allegations against Fairfax. Fairfax is the state's highest-ranking black politician. He has vehemently denied the women's accusations. Hope relented after getting feedback from other state lawmakers. The Arlington Democrat says he is continuing to talk with his colleagues about the best way for Virginia to conduct an investigation into the allegations. Hope acknowledges that "people are concerned" about him as a white person leading the call for impeachment proceedings against Fairfax. Black leaders from around Virginia are spelling out how they want the state's embattled governor and attorney general to fight systemic racism. Their recommendations include bringing down Confederate statues and increasing funding for historically black colleges. The African-American leaders challenged Gov. Ralph Northam and Attorney General Mark Herring in a letter obtained by The Associated Press on Monday. They are calling on Northam to lead a campaign to raise $5 million for each of five historically black colleges and universities. The letter came on the same day that a separate group of black community leaders said it had forgiven Northam and was willing to give him a second chance after he admitted to wearing blackface in 1984. Herring acknowledged wearing blackface at a college party in 1980. Some black clergy and community leaders say they forgive Gov. Ralph Northam for wearing blackface three decades ago and want to give him a second chance. The chairman of the Virginia Legislative Black Caucus is signaling a willingness to work with Gov. Ralph Northam on issues important to African-Americans. Virginia Lt. Governor Justin Fairfax says he has been able to focus on his official duties despite sexual assault allegations against him by two women. Fairfax reiterated his denials of the allegations in two new interviews published Monday. Fairfax told The Washington Post that he doesn't plan to resign. He said he attended church with his wife on Sunday in Alexandria and received an "outpouring of support." He told The Root that he's been able to continue his duties presiding over the Virginia Senate despite the allegations. He said, in fact, that "being able to focus on my official duties has actually helped." He also says he respects his accusers' rights to be heard, but that he deserves due process. A Democratic lawmaker had planned to begin impeachment proceedings against Fairfax on Monday but abandoned that effort. A group of black clergy and community leaders is asking for a moratorium on the widespread calls for Virginia's governor and attorney general to resign over their admissions they wore blackface in the 1980s. The Rev. Rodney Hunter is co-director of the Virginia Interfaith Center for Public Policy and pastor of Richmond's Wesley Memorial United Methodist Church. He said Monday that the records of Gov. Ralph Northam and Attorney General Mark Herring show "they are different people" than they were when they wore blackface more than three decades ago. Hunter says the group is also calling for an end to the push for Lt. Gov. Justin Fairfax to resign. Hunter said Fairfax deserves due process over sexual assault allegations made by two women. Hunter's group plans to hold a news conference Monday afternoon on the steps of the state Capitol. Historians say Virginia Gov. Ralph Northam wrongly used the term "indentured servants" when referring to the first Africans to arrive in what is now Virginia. Scholars say they were enslaved. During an interview Sunday on CBS, Northam said the "first indentured servants from Africa" arrived in 1619. Interviewer Gayle King interjected, saying, "also known as slavery." Northam replied "yes." Northam said in a statement Monday that a historian recently advised him to use the "indentured servant" term. He said he's "still learning and committed to getting it right." Virginia Gov. Ralph Northam says he initially overreacted to a yearbook blackface photo in comments that set off a political crisis engulfing the state's Democratic leadership. Northam told "CBS This Morning" in an interview broadcast Monday that he was "in a state of shock" and mistakenly took responsibility for the image of a man in blackface and a man in a Ku Klux Klan outfit because he had never seen it before, even though it was on his yearbook page. He says he's learned that he needs to better understand what it means to be "born in white privilege." And he says everything happens for a reason, which is why he plans to dedicate the rest of his tenure as governor to policies aimed at helping his black constituents. He says he'll "focus on race and equity" as his "commitment to Virginia" for the next three years. A Virginia lawmaker is now suggesting he won't move forward Monday with plans to introduce an impeachment bill seeking the ouster of Lt. Gov. Justin Fairfax. Democratic Del. Patrick Hope had said he wanted to introduce articles of impeachment Monday against Fairfax after two women recently accused the Democrat of sexual assault in the 2000s. Fairfax has vehemently denied the claims and called for authorities, including the FBI, to investigate. Hope said on Twitter early Monday that he had circulated a draft of the impeachment action with his colleagues and received what he called "an enormous amount of sincere and thoughtful feedback." Hope now says "additional conversations ... need to take place before anything is filed." Virginia lawmakers are facing calls to attempt impeachment of the state's second most powerful leader as they struggle to address sexual assault allegations leveled against Lt. Gov. Justin Fairfax. The push comes as separate revelations of past racist behavior have upended the two other highest positions in state government. Gov. Ralph Northam and Attorney General Mark Herring, both Democrats, have acknowledged they wore blackface in the 1980s. Northam said Sunday that he won't resign.